Rhubarb is one of those things that I hated as a kid and discovered I liked as an adult. It is a perennial that has a fairly short season during April and May. In the Northwest US they can sometimes get a second harvest in the fall. And it’s so easy to grow! I love the plant it once and harvest for years stuff! The taste reminds me of tart apples with a texture that resembles celery. Only the stems are edible, the leaves contain toxic amounts of oxalic acid. 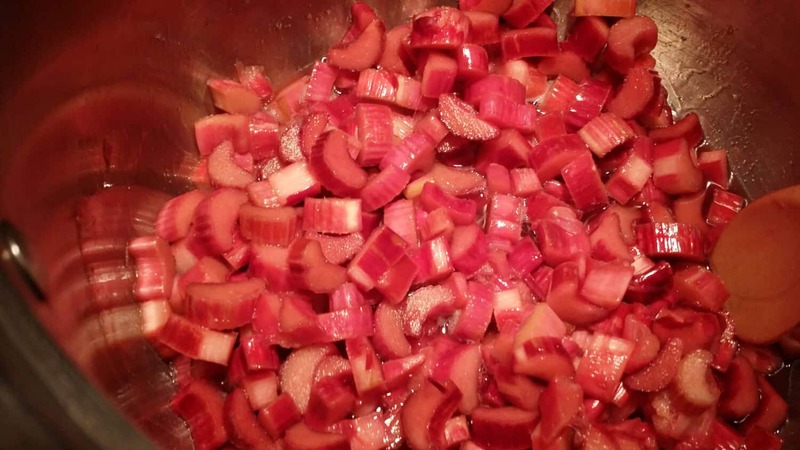 The color of rhubarb can range anywhere from a bright ruby to a soft pink all the way to a light green, and makes a beautiful presentation whether it’s served as a crumble, juiced for a salad dressing, made into jelly, or used to flavor water kefir. Canned rhubarb is one of those things I love to have on hand in the dead of winter when you just. want. some. fruit! And canning rhubarb is so simple! 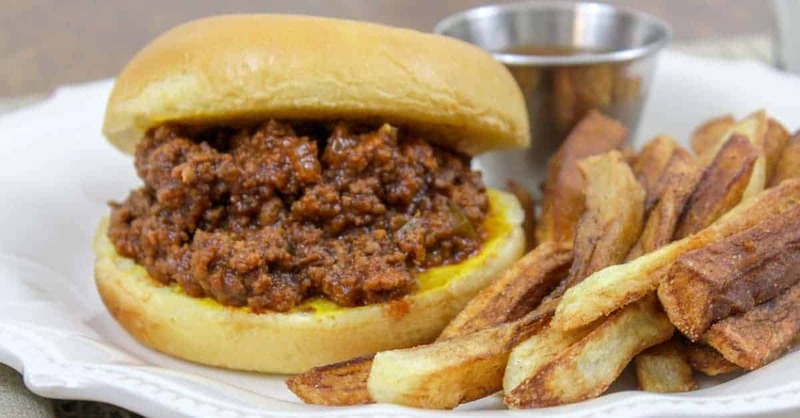 I know I say that about a lot of canning recipes, but canning really isn’t hard. If you are new to canning, or just need a refresher, you can read all about it here. 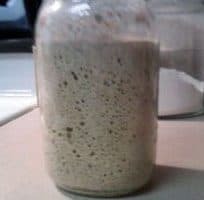 This recipe can be processed either in a water bath canner or a pressure canner . I used a pressure canner so that’s what you’ll see in the pictures. 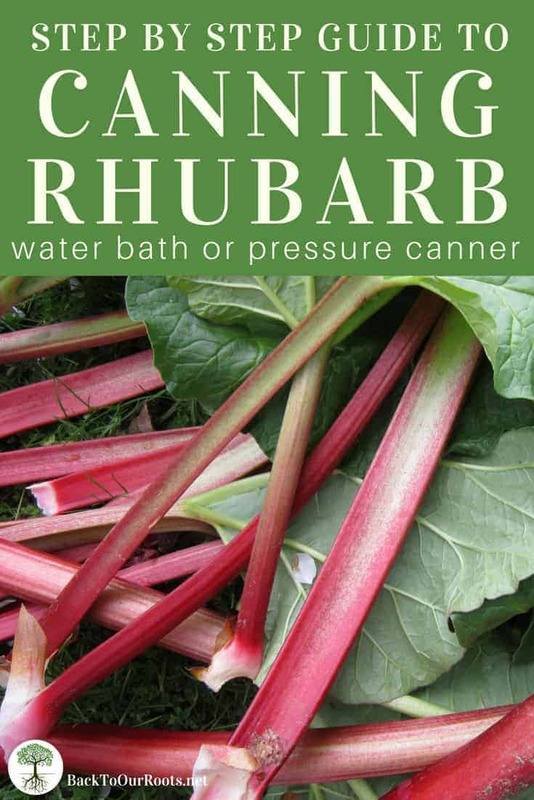 You need about 1 1/2 to 2 pounds of rhubarb for 1 quart or 2 pints of canned rhubarb. 15 pounds will give you 7 to 10 quarts, or 14 to 20 pints. And approximately 3 cups of raw sliced rhubarb will yield a pint of canned. I process mine in pint jars because that gives me enough for a 9″ x 9″ crisp. You would need 2 jars if you are making a pie. I’ve never bought it to can, I just harvest what I have. It’s nice to know what the approximate yield will be before I start, though. After harvesting the rhubarb, remove the leaves and cut out the bad spots. Wash in a sink of cold water. Remove the stalks from the water and put them in a colander so they can dry. Once they’ve dried a bit, slice them into about 1/2 inch pieces. 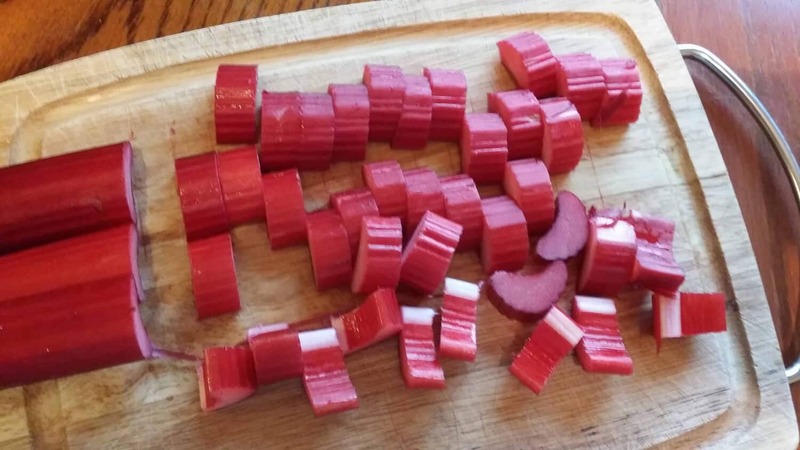 Measure out how many cups of sliced rhubarb you have. For every 2 cups of rhubarb, measure out 1/4 cup of sugar. 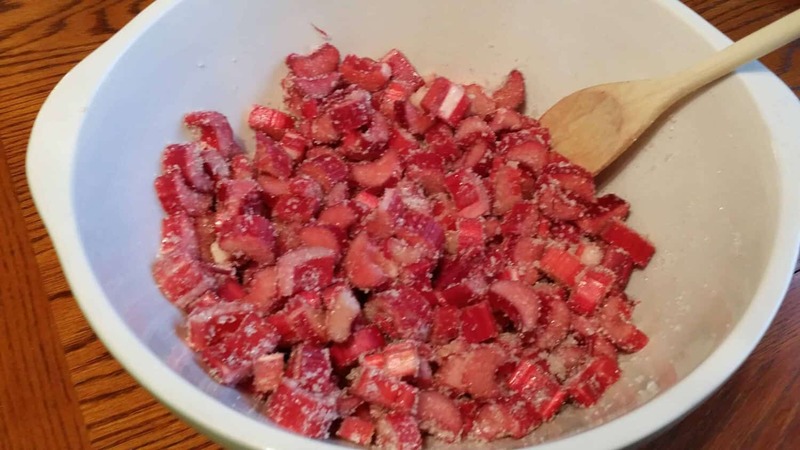 When everything is measured, mix the sliced rhubarb gently with the sugar in a large non-reactive bowl or pot. Cover the bowl or pot loosely and let that sit until the juices start to run. I just toss a clean bread cloth over the bowl. This part should take about 2 hours or so. If you get busy and leave it for longer, no worries. While that is sitting and you wait for it to get juicy, you can start getting your jars and lids ready. Before preparing the jars, make sure you check the rims for any cracks or nicks that could keep the lids from sealing. If you are using a water bath canner, fill the canner and put the correct number of jars in it. You know you have enough water when the water level is just over the top of the jars. Bring the canner to a boil. Once it has boiled for 10 minutes your jars will be sterilized. When you remove the jars from the canner to use them, pour the water back into the canner. When I’m pressure canning I run my jars through the sanitize rinse cycle on the dishwasher with the heated dry option. That keeps my jars hot for about 45 minutes after it stops. To prepare the single use lids, put new lids and the rings/bands in a pot of water and bring it to a boil. Then turn it down to low and let it simmer for about 10 minutes. This softens the sealing compound around the outside of the lid and allow the seal to form on the jar. If you are using the reusable Tattler lids, follow the directions that came with them. So what’s a “non-reactive pot”? That would be stainless steel, or an enameled pot that isn’t cracked or chipped. Using aluminum can cause whatever you’re canning to discolor and have a weird aftertaste. Bring the rhubarb/sugar mixture to a boil over medium heat. You want to make sure that you stir gently very frequently. If you don’t stir the sugar will scorch on the bottom of the pot. Once it’s come to a boil, remove it from the heat. Now get your jars set up to fill. I use a pizza pan to put my jars on. It allows me to carry them easily and it keeps any mess I might make corralled. Ladle the hot rhubarb mixture into the hot jars. Make sure that you leave a 1/2 inch headspace. Using a canning funnel will reduce the mess you have to clean off of the jar rim. Release any trapped air with a thin knife or a bubble popper . Run it around the inside of the jar until you can’t see any more bubbles. Now wipe the jar rims with a clean cloth that has been dipped in hot water to get any syrup off. Once the rim is clean, seat the flat lid and put on the ring. The rings are there to keep the lid on during processing and they just need to be finger tight. If they are too tight, they won’t allow the air to exhaust from the jars. 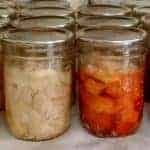 Follow the directions below for either pressure canning or waterbath canning. 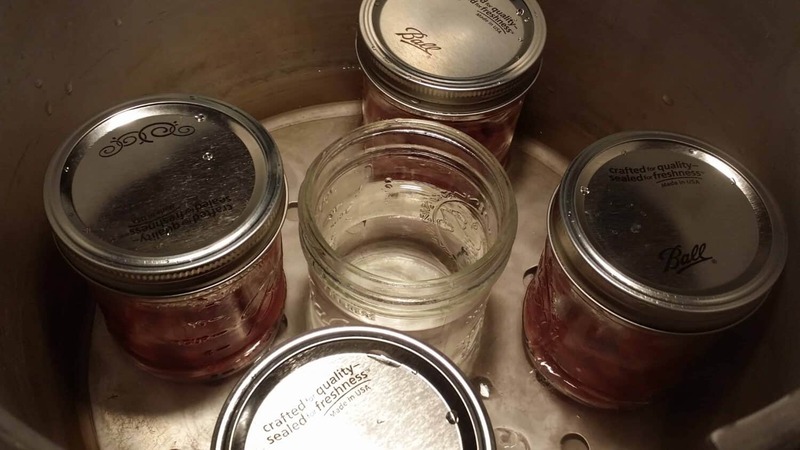 When your jars are filled and closed, put the correct amount of hot water in the bottom according to the directions that came with your canner. They’re all just a little bit different, but it’s usually 2 to 3 inchs. Put the jars carefully into the canner. I only had 4 jars, so I put another jar in the center with water in it so that the jars wouldn’t tip over during processing. Put on the lid and make sure it’s sealed. Turn the burner on high and bring the water to a boil. 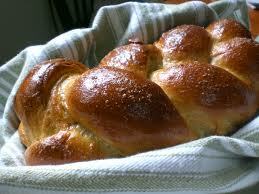 Allow the steam to exhaust for the specified amount of time your directions give you. Put the pressure regulator on and allow it to come to the correct pressure. Don’t start counting your time until the correct pressure is reached. If you lose pressure for some reason, you have to start timing again when the pressure comes back up. Process at 6 pounds of pressure for 8 minutes for both pints and quarts. Don’t forget to adjust pressure for your altitude. After the processing time, remove the canner from the heat and allow to cool. Never run cold water over your pressure canner to cool it. That could cause your jars to explode because of a sudden change in pressure. Follow the directions that came with your canner to know when it’s ok to open the canner. Open the canner with the lid facing away from you so you don’t get a face full of steam. Continue with the directions below for checking seals and storing. Have your water heating while you fill your jars. After filling and closing your jars, put them into the rack and lower them into the water. If you aren’t using a rack, carefully lower the jars into the canner using a jar lifter. Put the lid on the canner and bring it to a full roiling boil. Start your processing time. If for some reason you lose the boil, bring it back up to a full roiling boil and begin timing again. Process for 15 minutes for pints or quarts. Don’t forget to adjust processing time for your altitude. After processing, remove the jars from your canner with a jar lifter . Make sure that you lift the jars straight up out of the canner. Put the jars on a counter that has a double layer of towels on it. Putting the jars on a cold counter top can cause a thermal shock that could make the jars break. Make sure the jars aren’t in a draft, or cover them with another layer of towels. Let them cool without disturbing them for at least 12 hours. After the jars are cool, check the seals. If any of the jars haven’t sealed you can either reprocess them with new lids, or just put them in the fridge and use within about a week. If the seals are good, remove the rings, and wash down the jars. Put on a pretty label with the contents and date and a batch number if you made more than 1. Now you can enjoy looking at those beautiful jars for a few hours before you put them away! Store your canned rhubarb in a cool dark place. It should stay good, depending on conditions, for a few years. This canned rhubarb is great over ice cream and makes an awesome pie filling, cobbler, or crumble. 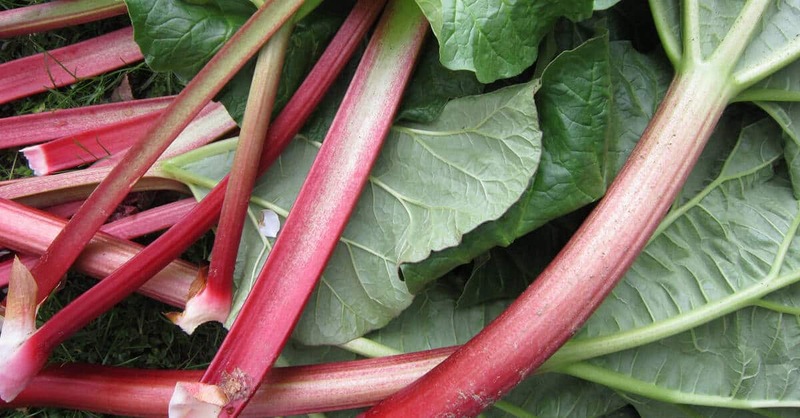 What’s your favorite way to eat rhubarb? Let me know in the coments. Can you can these with a water bath? I don’t have a pressure canner. You absolutely can! 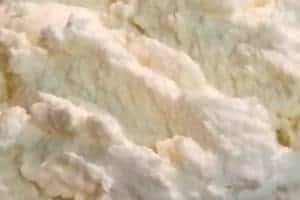 For pints or quarts process for 10 minutes. Hope you give it a try! Sharon, you can absolutely can it without the added sugar. So glad to see someone proclaiming our saviour! , and acknowledging what he has provided for us. Thank you ! Melissa. I also love to can! 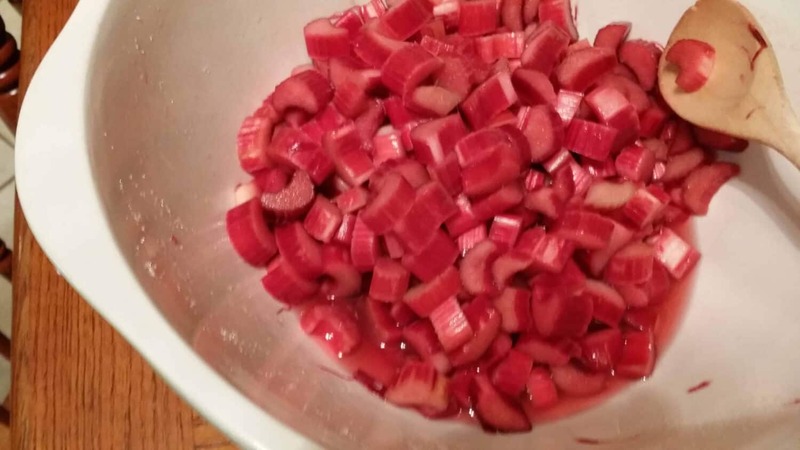 Using your recipe, I canned rhubarb for the first time. The jars look great when finished and I feel like I really accomplished something. I have a Power Canner XL using your recipe and their recipe….it worked. 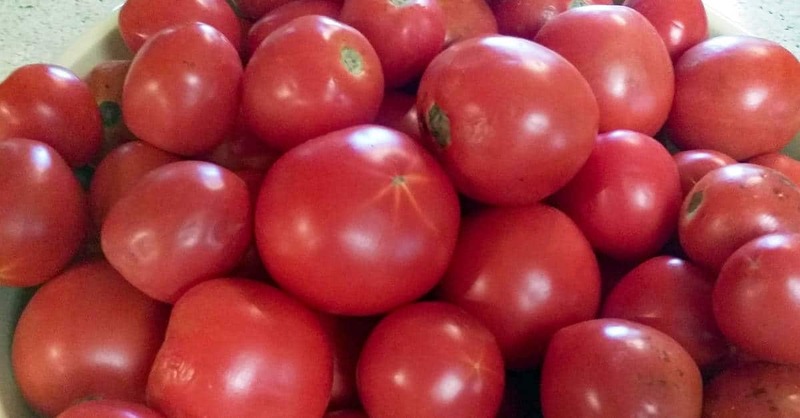 Now I am ready to do tomatoes and beans. 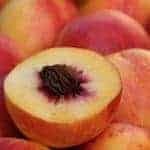 My grandmother used to can rhubarb adding, prunes orange slices,raisins in a sweet syrup. It was delcisious!!!!! Oh my gosh, that sounds amazing! I may have to try that this year! Could i add sweet cecily to the canning mixture to take the sugar content down? I use it with fresh but never tried canning. Hi Elli! Yes, you can add sweet cecily instead of sugar. 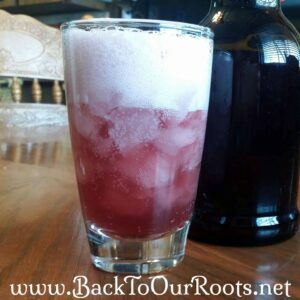 Sugar is not actually necessary to can rhubarb, it just helps to take down the tartness. Have fun! we grow rhubarb here in nova scotia we have a 150 foot row we use the rhubarb in june to make rhubarb pies as a fund raiser for our church and do very well. my husband and i also make strawberry/rhubarb crumble which is delicious. I love rhubarb and hate to let any of it go to waste! When you cook the rhubarb before filling the jars do you add the juice that you would surely get from the process to the jars as well? Hi Joan! Yes I do put the juice into the jars. Make sure you leave enough headspace. Blessings!